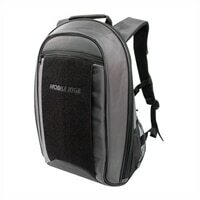 Mobile Edge Notebook Carrying Backpack 17.3Inch - GraphiteThe Graphite Backpack has a modern, edgy style that incorporates all the features you need when you're on the move. A dedicated padded computer compartment keeps your laptop protected, while separate sections for files, folders, magazines and accessories will keep your gear organized and at your fingertips! Multiple anchor locations for the removable ID holder provide quick access to your ID cards, wherever you may be headed. The Graphite Backpack has a modern, edgy style that incorporates all the features you need when you're on the move. A dedicated padded computer compartment keeps your laptop protected, while separate sections for files, folders, magazines and accessories will keep your gear organized and at your fingertips! Multiple anchor locations for the removable ID holder provide quick access to your ID cards, wherever you may be headed.